This is going to be a part of the history of the Internet. 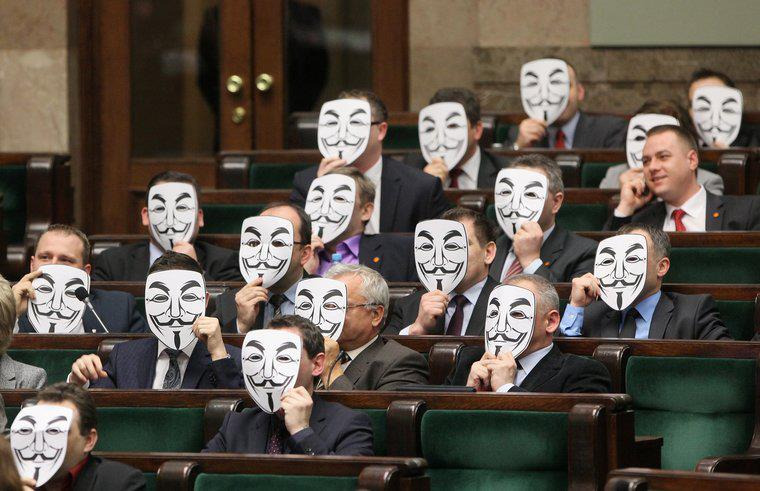 While the Polish Government signs ACTA, member of the parliament wore Anonymous-masks to protest against it. This epic picture is a mark for the movement and influence of Anonymous. The loose group, which doesn't have a structure itself, is a symbol for the fight for freedom in the net. Now, after "Operation Paperstorm", it's once more in real life, with politicians in Poland wearing the symbol of Anonymous, the Guy Fawkes-mask in the parliament. I see this as an acceptance, even by politicians, that Anonymous is fighting a legal battle for the Internet. For sure, we will see this photo more than once on the net. A call for other politicians in other countries to do the same and show the resistance against ACTA, which takes the power from judges and gives them to so-called right holders. And if we really must prove legality everything we own, we're all doomed. A witchhunt, that can be executed by big media companies at will.